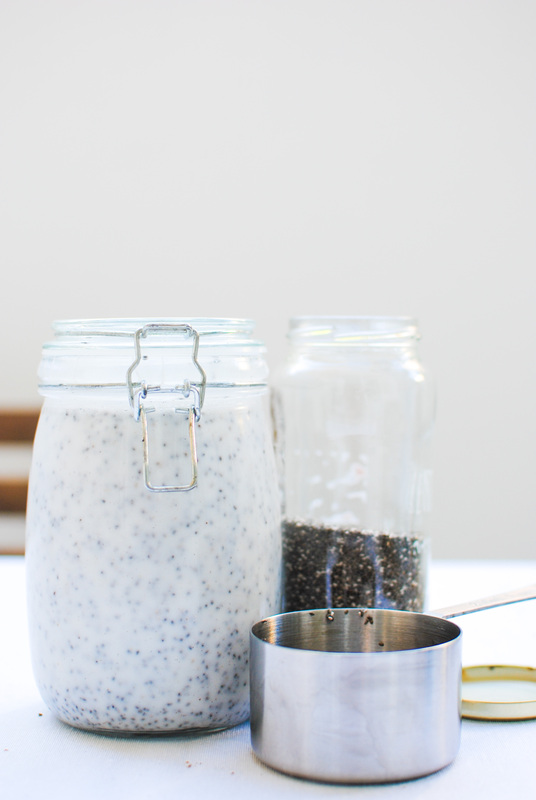 As soon as I got home from my Summer vacations, I started batch cooking for the week: chopped fresh veggies, made a simple hearty soup, breakfast bars, granola, cooked millet, avocado cream… and this Chia Pudding of course! I believe in meal prepping as a facilitator and an easy method for having fresh and healthy food on demand! The last thing I want when I batch-cook is a zilion lunch boxes all looking the same with perfectly measured calories and macros. My way of cooking for the week is all about making ahead some staples that will help me when making my lunch or dinner. Things like cooking grains and legumes (that can be stored in the fridge or even freezer), making dips and sauces, washing greens and keeping them fresh in tupperwares, healthy snacks for those fast-paced days, etc.To those, I can always add fresh veggies and/or fruit, sautée something in 5 minutes and have a healthy and balanced meal any day of the week. I make these big jars for years now, it lasts exactly one week and they’re the perfect option for an on-the-go breakfast or a quick snack in between meals. This super easy recipe will change the way you look at breakfast. Make it and you’ll have the first meal sorted for the next 5 days! Feel free to change the recipe up with different spices, natural sweeteners or plant milks, or even adding superfoods like maca, lucuma, spirulina, raw cacao…! Once you have the chia pudding made, you can always change the toppings with different fruits and granolas. A top tip is also to add this pudding to your morning smoothie, this will add soluble fiber and healthy fats to your drink, as well as thicken it up just a bit! 1. Add all ingredients in a +1lt glass jar. 2. Stir very well every 2 minutes for 10 minutes so you don’t end up with “chia-lumps”! Onde é possível arranjar a baunilha em pó? Em lojas bio nuns frasquinhos pequenos.